Time Tracker for Freshdesk. What are the alternatives? Time tracker for Freshdesk was one of the desirable feature requests especially from the consultant, web design and graphic design community. Before, in order to track time spent on support you needed to use other time tracking tools (like Time Doctor or Hubstaff) with Freshdesk. Nowadays, time tracker for Freshdesk allows you to monitor the time you spend on a support request, add notes, and even make the time record as billable. So, let’s see how today you can track time in Freshdesk. 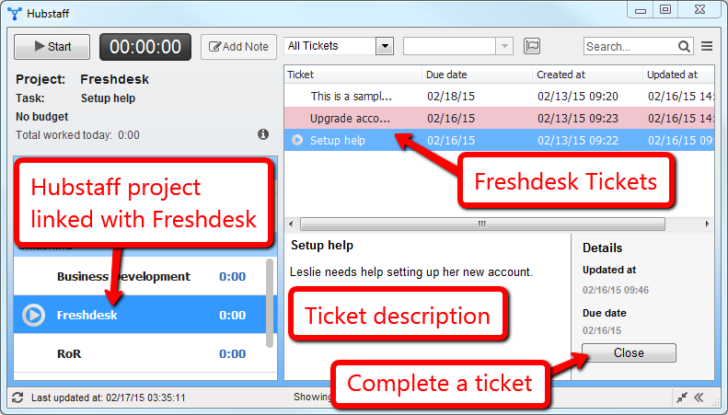 To start, you need to set up the Freshdesk integration for the company in Time Doctor. For detailed instructions, please click here. Then, tell your employees to trigger the integration in their own Time Doctor accounts. Once they have established their own integrations (only takes a minute), they can start tracking time for any sort of tickets assigned to them. For more details about third-party time tracking software that support Freshdesk integration look at our time tracking software selection guidelines. If you are not using any third-party time tracking applications, you can count the time your employees spend on solving each issue right within Freshdesk. You will not need an specialist to do all the accounting for you. Time Sheet reports in Freshdesk enable you to easily build the entire time log for one or several clients. You may also get the overall picture on time spent and also compare billable vs. non-billable efforts done by each agent. Click on an specific ticket to open it. On the right panel, you can see the Time Tracked area. You can go to Start Timer to trigger the clock and then click on the Stop Timer link to stop it. Feel free to click on Edit to manually change a time entry. You can delete the time record by pressing Delete. To add a new time entry, hit Add Time. 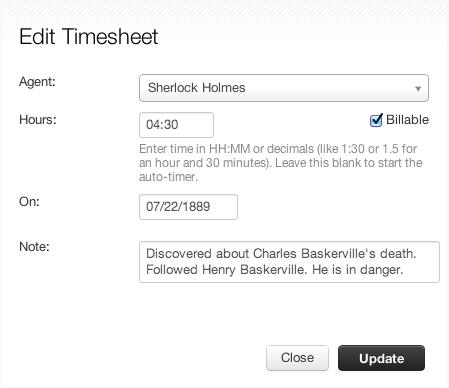 In the window that arises, you can enter agent’s name and the time you intend to log. You can choose whether the logged time is billable to the client or not, by selecting Billable option. You can also include some record on the time entry for future reference. It’s possible to record time spent on support tickets independently too.Many agents can append time records on a one ticket, but a single agent can’t add time entries on two support tickets at the same time. Remarks can also be inserted to each time record. 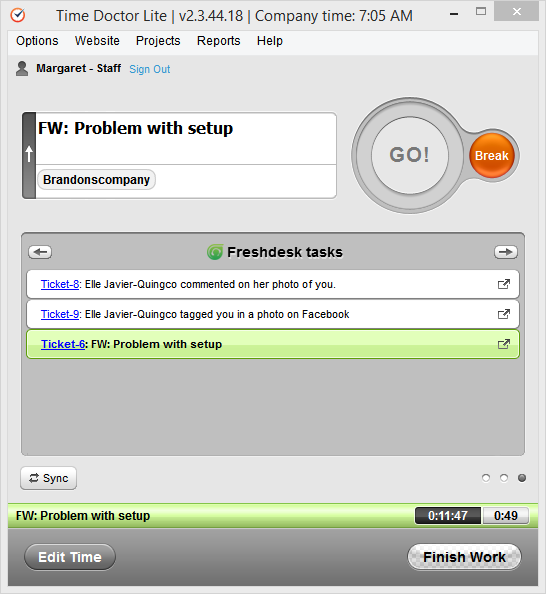 « Freshdesk time tracking software alternative comparison	» Time tracking in Freshdesk. What are the alternatives?